Barr Display has been serving the retail industry since 1946. We are a full service retail store display company. At Barr Display, we strive to offer you the broadest selection of retail store displays, custom store fixtures and retail packaging at competitive prices. We are proud to stock an inventory of over 3,000 store fixtures and store displays. Our inventory includes a full line of slatwall, slatwall accessories, grid panels, grid accessories, hangers, showcases, mannequins, golf pro shop fixtures and more. To ensure customer satisfaction, we sell by the piece, giving our customers control to order as much or as little needed without being subject to case pack requirements. We will make every effort to minimize your freight costs by using the most cost effective shipping point and delivery method. 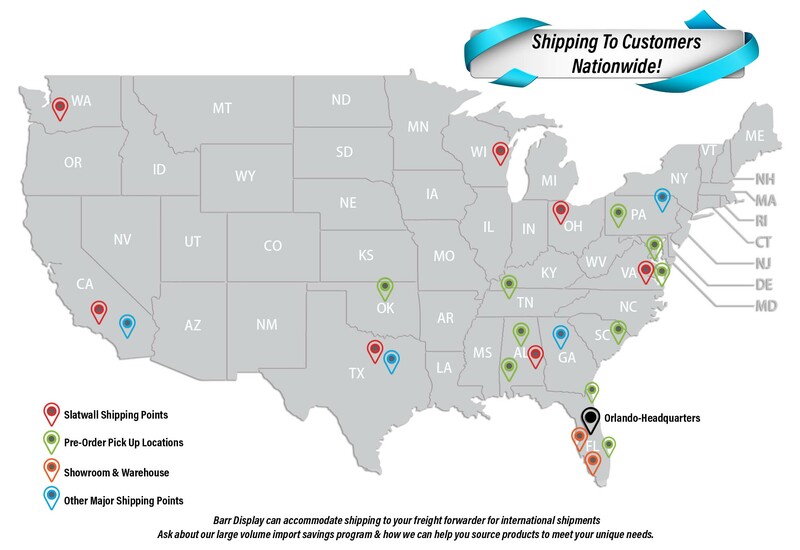 Most orders ship from our Orlando warehouse, however, we have shipping points all over the country. Additionally, we have select merchandise available for pick up in Tampa FL, Baltimore MD, Charleston SC, Nashville TN, Virginia Beach VA, Birmingham AL, Oklahoma City OK, Pittsburgh PA, Mobile AL, Jacksonville FL, Dania Beach FL and Ft Myers FL. Give us a call and we will be happy to help fulfill your order. Click on the location nearest you for more information!